Seven Secrets, final leader recording from guitarist Larry Coryell before his death in February, is uneven. Actually, that’s an understatement—it seems to be two separate albums entirely, with a remarkable drop in quality between them. This final incarnation of 11th House, Coryell’s seminal mid-’70s fusion group, features three of the band’s charter members (the leader, trumpeter Randy Brecker, drummer Alphonse Mouzon) and John Lee, its longest-tenured bassist. In place of Mike Mandel’s keyboards, however, Coryell’s son Julian handles second guitar. The result is a leaner, cleaner sound that crisp state-of-the-art production only augments. And on the album’s first half, it lends the 11th House a rougher edge than it ever had in its heyday. On the rocked-out “Mr. Miyake,” both the elder Coryell’s electric lead and the younger’s acoustic accompaniment cut sharp as razor blades, with Brecker providing a similarly lacerating solo. “Dragon’s Way” hits even harder, Mouzon pummeling the kit without mercy amid scorchers from the guitars and trumpet. Even Larry Coryell’s acoustic tune, “Molten Grace,” hides a knotty and barb-filled melody inside its folky pace. The album’s beginning, then, reminds us that fusion still has some vigor left in it. The back half, on the other hand, slides into the type of dullness and cliché that spawned smooth-jazz. Brecker’s “The Dip” is a facile funk groove that finds little variation even as it boasts one of only two bass solos. Mouzon’s “Having Second Thoughts” is the blandly pretty stuff of supermarket soundtracks. “Mudhen Blues” tries to rally, but results in the tritest of 12-bar tropes: a B.B. King impression without B.B.’s charisma. If you must have Seven Secrets, purchase it track-by-track—and stop after the first six. It’s how you’d rather remember Larry Coryell. Read Julian Coryell’s Farewell tribute to his father Larry Coryell. 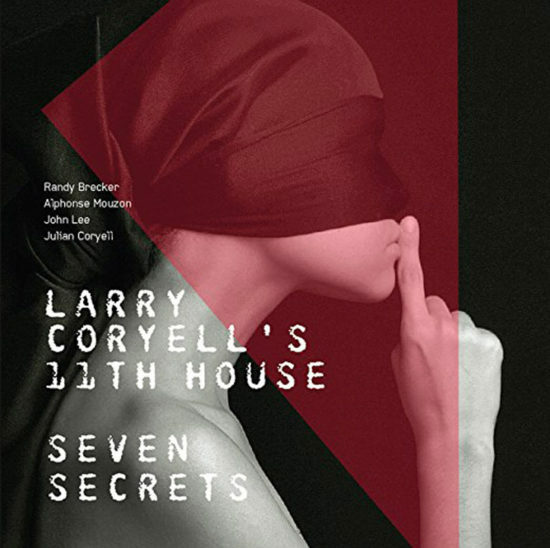 Preview and buy album Seven Secrets from Larry Coryell & 11th House on iTunes.